Between 1934 and 1938, my father and mother, Johannes and Elfriede Hoeber, lived in Düsseldorf, Germany and my father’s parents lived in Philadelphia. Because my parents and grandparents were part of a close family, they communicated frequently by mail. It was common for each of them to write a 4 to 6 page letter once or twice a week sharing the news of their lives. There was no transatlantic telephone connection and telegrams were outrageously expensive — it cost the equivalent of $50 in today’s money to send a one-line message that way. As a result, sea mail was the primary means of communication. 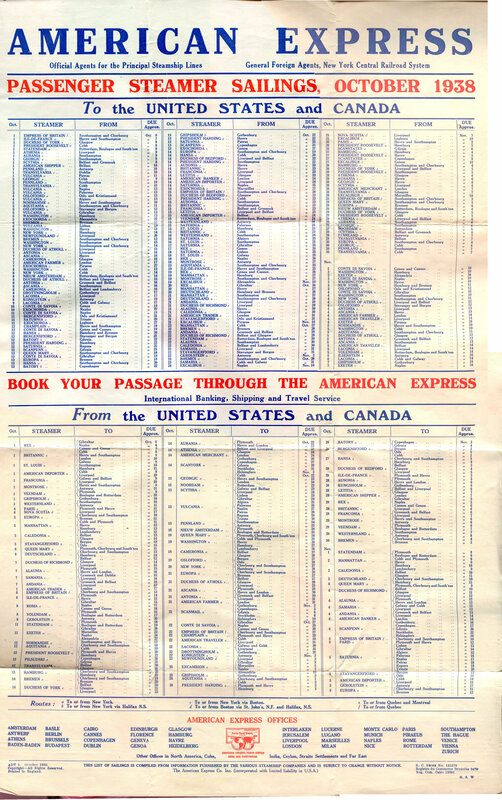 Shipping schedule used to select a ship for mail between Europe and the United States, 1938. Click for larger image. The mechanics of transatlantic mail were complicated. All mail went by ship, most often passenger liners that made the fastest trips between European ports — Hamburg, Bremen, Cherbourg, etc. — and New York. People who wrote frequently would buy a copy of the monthly European shipping schedule (above) that showed the various ships, the days they were scheduled to leave a particular port and the date of arrival in New York, as well as schedules from New York to European ports. A person sending a letter would look up the next ship departing from a nearby port and note on the envelope not just the address of the recipient but also the ship that should take it. Thus, in the upper left corner of the envelope, a writer might note “via Staatendam from Amsterdam.” The postal service would pick up the envelope from the mailbox and deliver the envelope to that ship, usually in one day. If you were in a hurry, you could send the letter from Düsseldorf to the ship in the port city by plane. Mail would be sorted on the ship and when the ship arrived in New York it would be put on a train to the right city or town. 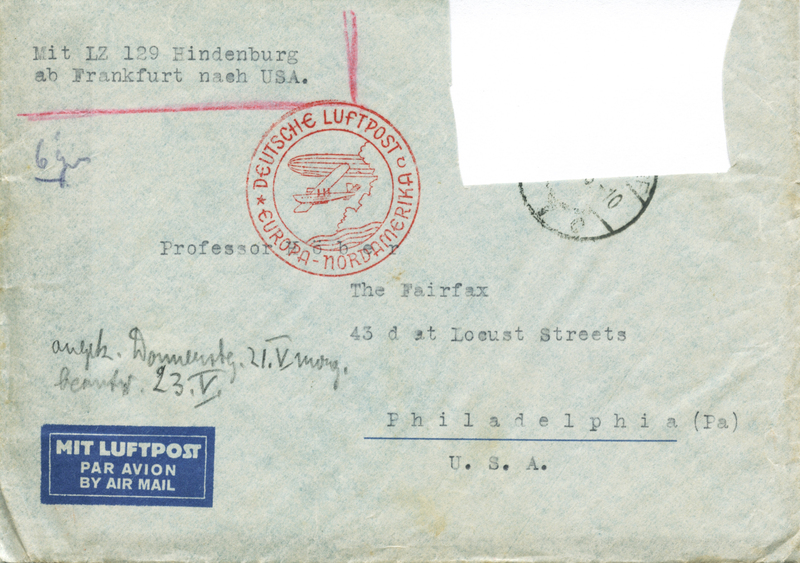 A letter mailed from Düsseldorf could thus be delivered in Philadelphia in nine or ten days. The Postal Service delivered mail twice a day, once in the morning and once in the afternoon except on Sunday. Letter to America from my father to my grandfather postmarked 8 November 1938. 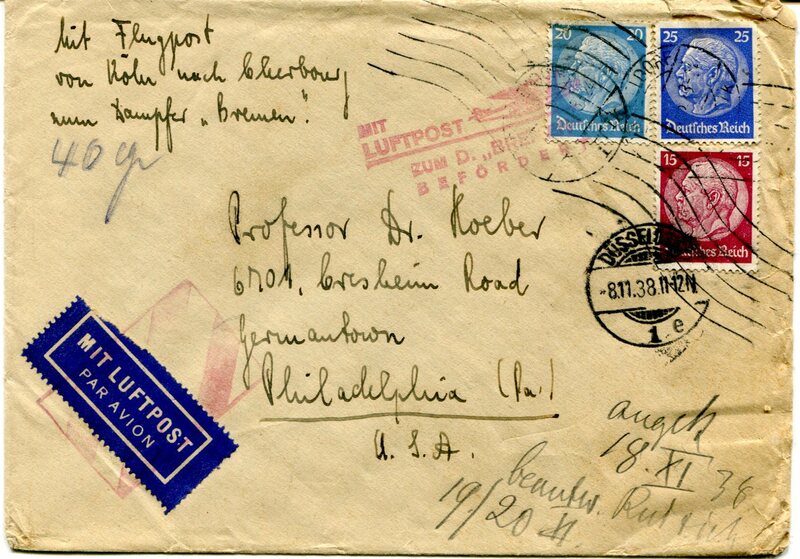 The notation at upper left indicates the letter was to be sent by plane from Cologne to Cherbourg, where it was to be delivered to the steamship “Bremen” bound for New York. My grandmother’s pencil note at lower right indicates it was received in Philadelphia on the 18th of November and answered on the 19th and 20th. In late 1935, a great new method for rapid communications was announced: overseas airmail. While the fastest ocean liners took six days to cross the Atlantic, the huge new dirigibles, named Zeppelins after their inventor, could travel at speeds up to 85 miles an hour and took mail across the ocean in only two and a half days. While air mail was more expensive, it was worth it to speed up the delivery of important messages. and clipped the unique Zeppelin stamp. Unfortunately this wonderful new high-tech service lasted only a year and a half. On May 6, 1937, the Hindenburg was destroyed when it exploded as it was landing in Lakehurst, New Jersey. Although there were other Zeppelin dirigibles, they were never again used for transporting mail. There was no air mail service between Europe and the United States for another two years, when Pan American Airways began carrying mail on its transatlantic Clipper planes in March 1939.